Witnessing dolphins and seals playing in their natural environment is so often a life-enhancing experience. You can make friends with these intelligent mammals just a short distance from Melbourne. Witnessing dolphins and seals playing in their natural environment is so often a life-enhancing experience. And you don’t have to travel far! You can make friends with these intelligent mammals just a short distance from Melbourne, at the picturesque seaside village of Sorrento on the Mornington Peninsula. Your adventure begins with a safety briefing on board the boat, followed by the journey on the beautiful southern waters of Port Phillip Bay. 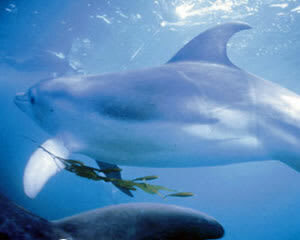 Swim with wild bottlenose dolphins, explore reefs with sea dragons, view marine life and frolic with playful fur seals. Highly trained and experienced crew introduce you to snorkelling with an emphasis on safety and environmental awareness. Open water experiences abound. This truly is the marine adventure of a lifetime. Dolphins are wild animals and interactions cannot be guaranteed on every occasion. We use a multi-award winning eco tourism business that embraces sustainability principles. Passenger safety and the dolphins' protection are of paramount importance, and so we purposely limit the size of our trips to guarantee a high standard of customer and environmental care. Our on-board facilities include a galley for serving refreshments, change areas and toilet. Wetsuits, masks and snorkels are all supplied. Reef and seal swims are often part of our trips so be prepared to see and experience much more than just dolphins. Our season is from October to April inclusively, trips depart at 8:00am and 12:00pm daily. The boat trip will last approximately three (3) hours! Numbers on the boat are strictly limited to make the experience more enjoyable. This was the best experience , neisha loved it and the people who do this , as they remembered her name and she said she felt like she had known them forever , I'd recommend this to anyone and will be doing this again as the people are so damn nice . Never ever found a better deal than this. It's worthy if you wonder. Go Swim with them beautiful creatures. We cannot recommend this experience and this team highly enough. I booked this as a birthday present for my partner and it was an absolute blast. We had Jess, Troy and Ben with us who were all incredibly friendly and clearly love what they do, and they made sure we had a great time! We saw dolphins soon after getting on the boat, and everytime we stopped for a swim. They put on a fantastic show, and you'd get to see them as close as only a metre or two away! The seals weren't particularly active on our trip, so we didn't swim with them this time, but they're still great to watch. This is a must-do experience, with a phenomenal team who run it so well. We'll be back! Couldn't recommend this any more, everything was perfect! A great adventure! Lots of fun for all!